Chelsea Pants Blog Tour: Skinnies! 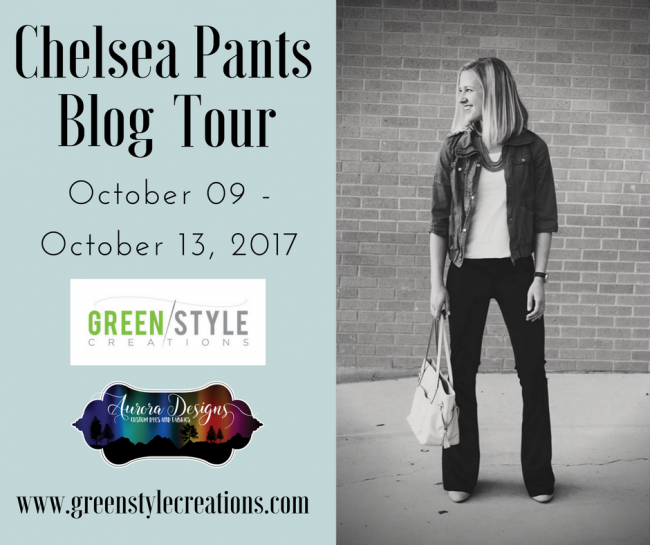 Welcome to the Chelsea Pants Blog Tour! This is the first blog tour I’ve organized for Greenstyle Creations (or anyone, for that matter! ), but I’m really excited, because it means that I get to keep sharing my new favorite Chelsea pants, and linking up to other awesome bloggers who will do the same! Of course, if you’ve been around my blog in the last week, you’re probably thinking….more Chelsea pants?! Doesn’t she have enough of those yet? Nope, nope, nope. 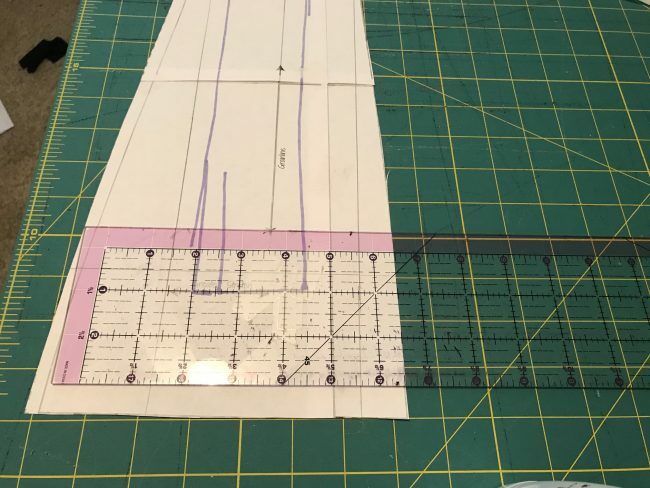 And while last week’s pairs were all cut straight from the pattern (except for the usual grading/shortening), this week I get to go off the books, and share a little hack with you! One thing about working with a pattern company, is that sometimes you test things that you aren’t initially sure you’re going to love (remember my Thong Plan? ), but end up trying anyway, because it’s part of the “job” (it’s a tough gig, but someone’s got to do it!). This forces me out of my comfort zone a little bit, and opens my wardrobe up to new styles and trends. The Chelsea pants were like that for me- I’ve never worn bell bottoms, because I’m too short for anything off the rack, and hemming them after construction means that they end up looking like boot-cut pants rather than bells. So I was pleasantly surprised by how much I loved the dramatic flare of the Chelsea pants, and I’ve got several more in the works! However, I’m a skinny jeans girl at heart, so I knew from the get-go that I would try to hack them into skinny pants, and that’s just what I did! I used a black ponte from my stash that is super stretchy and has an awesome thickness and recovery- I wish I could remember where I purchased it, because it’s really high quality. 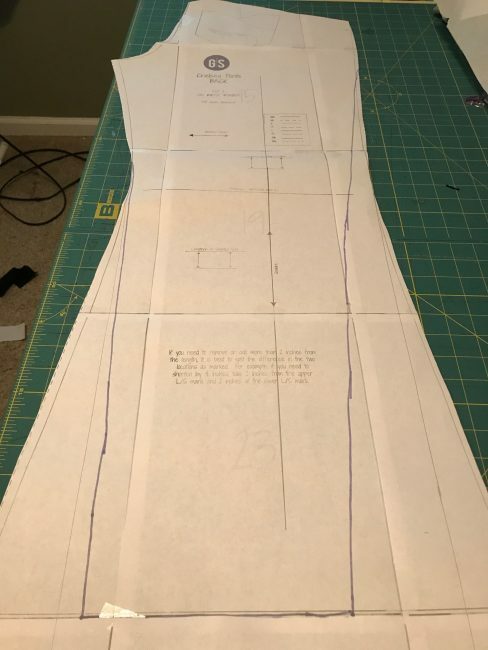 I started the hack by drawing a tapered line down from the knee point to the bottom of the pants from the inner leg seam and the center front seam on both the back and front pieces. I then sewed the center front seam of the pants using these pieces, but did not topstitch, instead using a basting stitch along the inner legs to test out whether they had achieved my desired “skinny-ness”. The amount you need to adjust is going to depend alot on your fabric- I would need to take less out of a stretch denim than I did with this super-stretchy ponte. You want to make sure, as you’re basting and hacking away at the center front seam that you’re keeping the seam right down the front of your leg- too much off either side and you’ll end up with a twisted seam. I would serge some off, pin it around my leg, and then mark a new line to serge, etc. 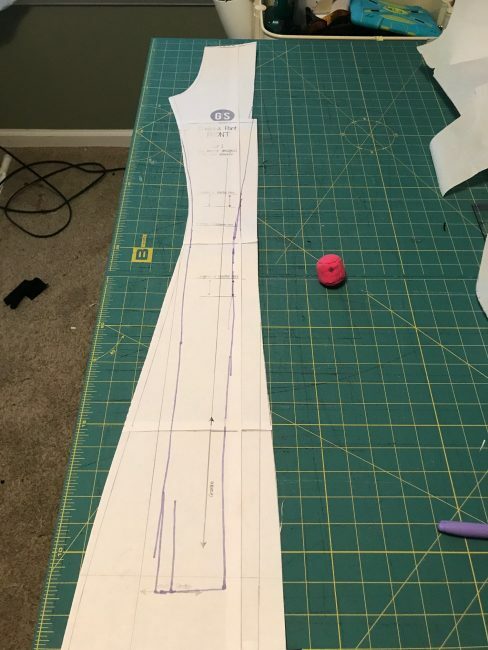 Keep track of all your adjustments so you can alter the second leg to match, and have a pattern piece for next time! After I had gotten the legs the way I wanted them, I toptsitched the center front and went to work on the inner leg seam. The way the pattern instructions have you sew up the legs is helpful here, because you can make small adjustments to the inner leg seam as you go. Again, just be careful that the center front seam doesn’t get pulled toward the side. 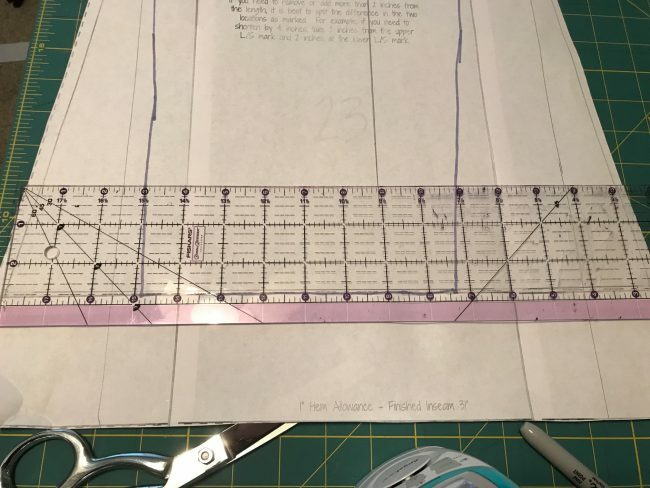 The purple line in the photos shows how much I took these in, but again, your mileage may vary depending on your fabric and how much you want to narrow the pants. I’ve tried to provide some measurements here with the ruler, so you can see what I did- don’t mind the messy floor! Less time cleaning means more time sewing, right? After I was finished with the legs, I added back pockets, using a more traditional “jeans” pocket shape and topstitching, to match my “jeggings” look. While the pockets included on the Chelsea pants are adorable, I needed something a little larger for my phone, and this fit the bill perfectly. I also went with the high rise waistband, using a compression knit for the inner pieces to help hold everything in. This hits a couple inches above my belly button, in case you’re wondering. I’m in love with my new pants, and hope this helps show the versatility of this pattern, if you’re willing to get a little creative! As a side note, I’m wearing my very favorite Slim Fit Raglan here- it happened to match perfectly! Each day this week we will have one or more bloggers on the tour posting their Chelsea pants, tips, hacks and tricks, so stay tuned! Would you like to win a pair of the Chelsea pants (or another Greenstyle pattern, if you’ve already purchased the Chelsea’s) for FREE? How about some awesome stretch denim from Aurora Fabrics to complete the package? Enter the giveaway below, and check out all the other bloggers on the tour! Don’t forget to subscribe to my blog, and follow me on Instagram so you don’t miss a post! ​Note: this post contains affiliate links. Thank you for your support! Loved the different looks you made from one pattern. Love the little details of this pattern and would love a pair in the grey and ivory. 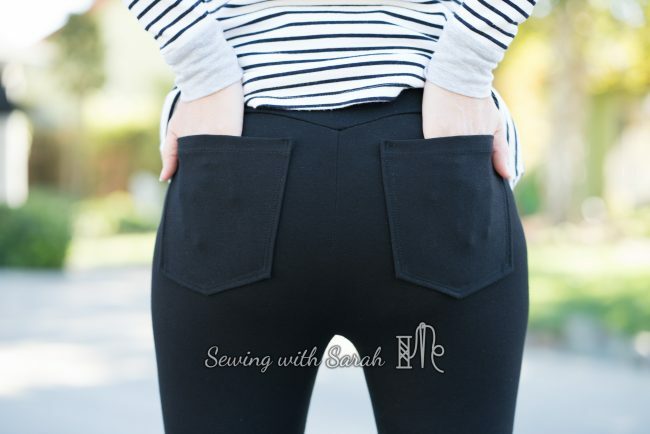 I love the pockets on the Chelsea and this skinny cut hack! Love Auroras red & ivory stretch denim! I was wondering how this pattern would look as a skinny jean. Thanks for waking us through your process! Love the Chelsea pant pattern! This hack is exactly what I was looking for. I love a good skinny jeans, but was hoping I could figure out how to taper them in to be slim for wearing to work in a stretch corduroy. I love a good black denim, but the red and ivory is super unique and pretty. This is awesome! I love your hack and the added value to the pattern… It is like 2 in 1! Perfect! Thanks for this hack, Sarah! I love the Chelseas, but I’m only 5’1, so really flared pants often look weird on me. Nice to have a guide for a skinnier option. The (new-to-me-fabric-company) Aurora Designs stretch denims are all tempting! Slate with shimmer and grey/ivory are at the top of my list. These make a great outfit! Love the Indigo. I’ve already purchased the pattern but haven’t tried it yet. I’m excited to try out the button hack. Yes- that’s a super fun one! I love what you created. What a versatile pattern. I love the front seam details on the Chelsea pants. It’s stylish and keeps with the sportiness of greenstyle. Im also a huge fan of flares! Iwant a pair of these in every color! did you measure your legs first? I have big legs and always wonder if ‘skinny’ pants would work for me. If you mean width wise, no, I just started with a straight type cut and brought it in from there. These are SO lovely-I love the bells, but this makes them even more versatile. I’d love some skinnies like this in the Aurora black stretch denim-it would be very Audrey Hepburn. I love the center seam down the middle. I would definitely get the black denim! Love this hack! Thank you for sharing! I like the dark indigo stretch denim for the Chelsea pants and my favorite feature is the bell bottom flare- I like the look of the flare and have been only really able to find leggings that are straight down or taper in and I have larger calves which make grading patterns a necessity, with these I think it will be much easier. Yes- you might not even have to make any modifications at all! Oh my – that’s quite the transformation. I’ve made 5 pair of Chelsea pants with the flare. Its a great pattern. These pants will fit many body styles, and that is awesome. I love the waist band and pockets. Wide leg or skinny….either would look awesome with the Aurora Dark Indigo. I love bell bottoms, but have never tried to make them. Do believe that is going to change with the Chelsea pattern! I hadn’t either until now! You’re going to love them! I love your skinny leg hack! 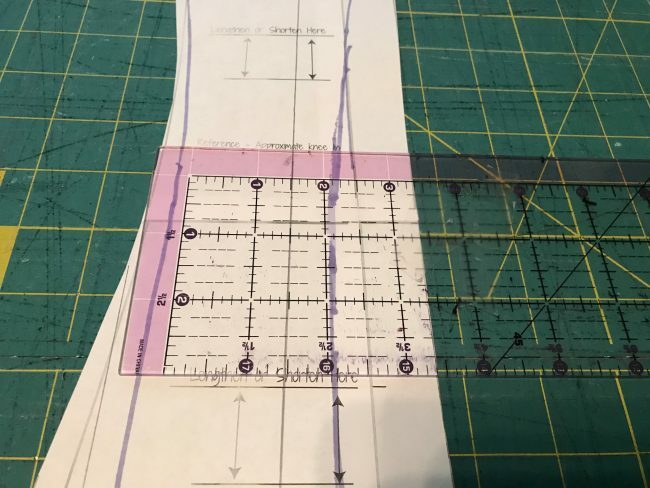 I’m super short, so even though I haven’t been sewing pants very long, I definitely see the benefit of being able to tailor length and proportion! I’m only 62″ tall so I know how that is- so freeing to be able to tailor our own wardrobe isn’t it? I would love to use the slate with shimmer and do a skinny Chelsea! As soon as I saw these pants, I oved them, but the flare is so not me! Love the straight legs though and I plan to use your hack for mine too! Thank you. I’m glad the hack helped inspire you! Please tag me when you’re done- id love to see them! Indigo Denim for me, too! I love the skinny pant hack! I love how they look like “real” pants and are so flattering. I would use the slate with shimmer to make something fun! Looks great! I love the front seam detail feature of the Chelsea Pants and would love these in a navy stretch denim. I love these. They look like they fit perfectly! Id love a pair in black! It’s great being able to customize something to your body! Thank you! Can’t wait to try this pattern. Love the top if the oants and the seam down the front!! I’ve requested to join the fabric group, cannot see denim colours yet… I’m hoping for a purplish navy or sage green denim!! I love that there is a high rise option and the versatility of the pattern. They would be awesome in the slate with shimmer stretch denim. I love these! Thanks for the hack!! You’re welcome! Can’t wait to see your next pair! Indigo! I love the versatility of this pattern! One of my favorite things about the Chelsea pants pattern are the pockets and also the button hack option! So cute!! And the slate with shimmer stretch denim looks amazing!! I plan on making a pair for my tall friend who wants flares but can never fit in them off the rack. I will likely try the skinny pant hack as well, as I love the center seam look but I am a little scared of the flare. Maybe in like…a lighter weight fabric for more of a flowy palazzo? 🙂 I look forward to playing around with this pattern! I love the seam down the front!! I’d probably get the navy stretch denim! I like the slate too! And that front detail is so unique! I love the seam down the middle. It has a very slimming effect! And I would definitely pick the navy. Thanks for the giveaway! These look so good on you! I really am loving the back you detail. Slate with shimmer could be fun! And I wasn’t convinced on the pattern with the bell bottom, but I love the skinny look. The shimmer would be very festive! Can’t wait to get started!!! Thanks SEW much!!! Fabulous hack Sarah! I’ll definitely be doing this! I’m a petite girl and I really like the way the seam down the front elongates our legs. I’d love to use the red with ivory or tan with ivory to make a pair of Chelsea skinnies! Black stretch denim would look good. Slate would be great also. I like the seam down the front! I love the high waist option! I’m a sucker for a high waist pant. I would use the navy. I love the front leg stitching and the button hack for the waistband. And the red and ivory is calling my name! I love the Chelsea pants they look so comfy and dressy which would be nice to make- I’ve never made pants before! Not even leggings, so it would be interesting to try. I’m loving the black and slate with shimmer!! Too Cool. These look like a great, versatile pattern. I thought I didn’t need another pants pattern, but now I am reconsidering! Love the skinny leg hack! The center seam is a great detail. I love the indigo denim. I love what you’ve done with these pants. It shows how’s versitile the pattern is and I think it will look great on every body style. I would love the seam down the middle, but not sure I’m confident enough to try that yet. I would love the slate and shimmer or black as they are both easy to dress up or stay casual. Amazeballs!! My question is… why didn’t you post the skinnies while the pattern was still on sale?? I hadn’t hacked it yet! Lol! Can’t wait to try this for work pants! Your navy corduroy version the other day and now your skinnies have me rethinking I could use this pattern even though initially the bell bottoms sent me scrolling right by the pattern announcement. I love them! Goes to show the versatility of the pattern. Love the bell bottom part of the pants and would love a pair in gray stretch denim from Aurora Designs! Those pants are perfect! I’ll have to be brave and try! I love this look! Great job modifying for your body type and preferred style/fit! I love the front center seam and the idea of tailoring paints to my own measurements from the start. The navy and the grey and ivory are both calling to me! O love the sTlimmed down pair! I would love to do that in the slate. I’d love to try this pattern and I especially love the slate with shimmer fabric. Thanks. 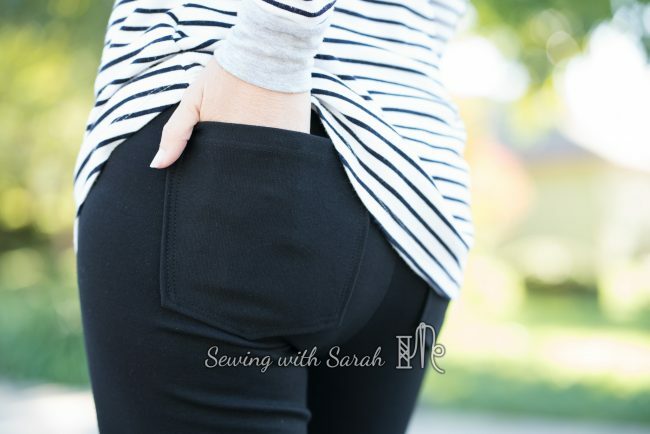 Great jeggings hack to get more out of a nice-looking pattern! 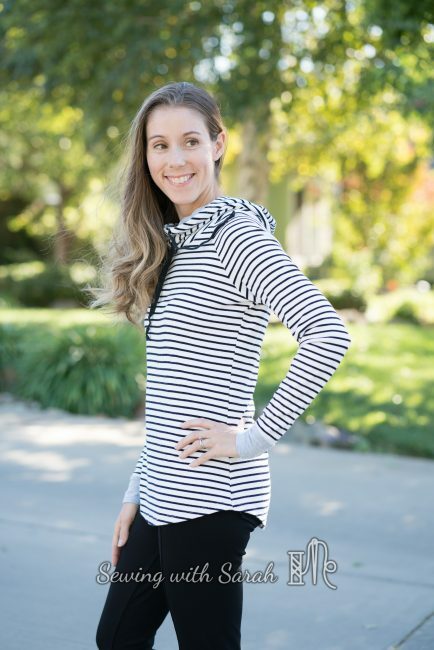 Love the pockets and the fit on the Chelsea! I’m struggling a little with some of the ‘whiskers’ I see on some but the ones that don’t have that are love! I’d like the Grey or red stretch denim! Pants fitting is so complicated isn’t it? 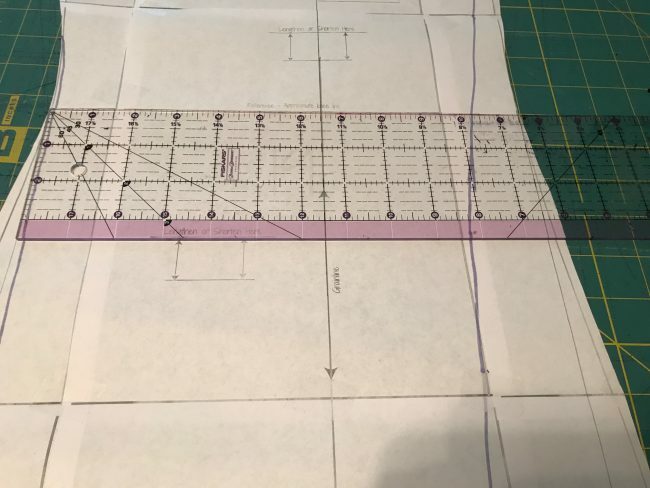 If I view them the way I view RTW, I’m totally stoked, but I can always find room for improvement in fitting as I learn more and more about how to make things fit my body well. Bell bottoms aren’t really me either! These look fabulous!! Thanks for sharing! I need a nice neutral like grey or navy or black. I love your skinnies version !!! Thanks Danielle! I know they’ll look awesome on you too! I love the buttons, and I would use slate with shimmer! Wow this pattern looks amazing! And I am in love with the slate with shimmer color! Truth is i want them all! haha- me too! I want all the stretch denim…. I totally agree- its awesome to see them on everyone! I can’t wait to use this pattern. I especially love the button front. I’d use grey or indigo! Maybe the red too. I have to admit I wasn’t quite as interested in the Chelsea (I know, how could that be?) until I saw this post! I love the way the Chelsea fits, and how adaptable it is!! I am a child of the 70’s who “rejected” bell bottoms as a teen, so it has been hard for me to open my mind to them, but this post did it, even though it was about making them skinnies…I think it just reminded me to be open-minded to trying new things. And I would love to make them in the grey/ivory stretch denim from Aurora. It’s a gorgeous fabric and I think it would make the front seams of the pants really pop! Great point- I was the same way- never really into bells but now I love them. Of course, skinnies are still my fave! Love how you can go from skinny to boot and wide leg all with one pattern… I’m going to make a pair in black, grey, navy oh what am I saying… ALL the colors!! Thats my favorite part too- its like a 2 for 1! I’d like to try these, and see how they do on a short and wider bod. I think they would look awesome!